Water, Tomatoes (tomatoes, tomato juice, citric acid, calcium chloride), Fresh Jalapeno Peppers, Fresh Onions, White Vinegar, Dehydrated Onions, Salt, Garlic and Flavour. A hearty, premium salsa. Ideal as a dip, topping, or garnish. Medium. Packed 2 jugs to a case. 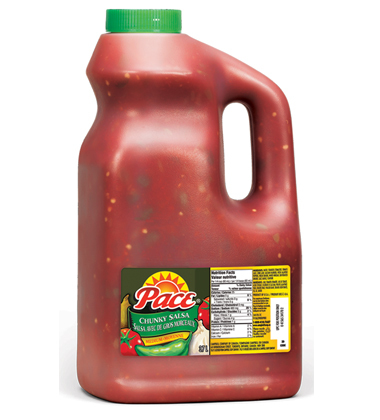 Canada's #1 FoodService salsa. Only fresh jalapenos are used. No preservatives, thickeners or fillers. For More Information call our Creating Possibilities Hotline at 1-800-461-7744.